Figure 1. 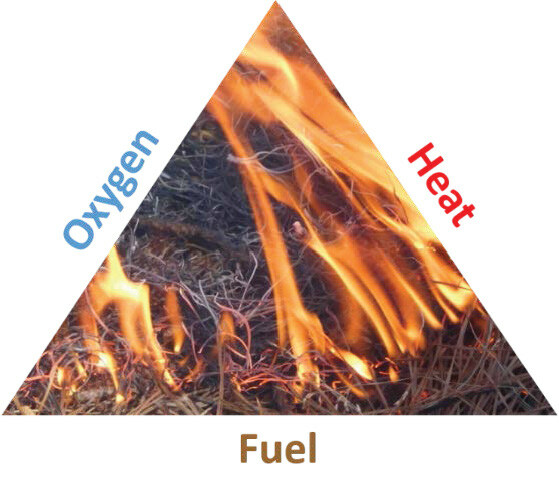 The three components needed for a fire to occur are oxygen, heat, and fuel. These make up what is called the fire triangle. Remove one of the sides from this triangle and a fire cannot occur or will be extinguished. The way a fire burns depends on a number of characteristics of the fuel. An often forgotten component is the predominant species of the fuel. Not all grasses burn the same; neither do all hardwood leaves or even pine needles. For example, leaves in an upland hardwood stand tend to curl on the ground and retain moisture (figure 3). This can make it difficult to sustain a fire. Most fires of this fuel type are low intensity and slow to spread (figure 4). 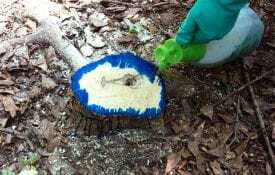 In a mature pine plantation, the pine needle layer is matted and mostly flat, with the exception of the top layer(figure 5). 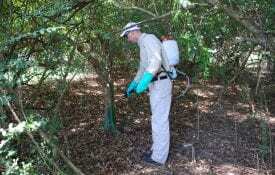 Due to rosin in pine needles, the needles willignite with little heat and carry fires of greater intensity(figure 6). There are three types of fuels: ground, surface, and aerial. Ground fuels are flammable material found below the surface litter (tree roots, duff, peat). Surface fuels are those found on the forest floor (leaves, needles, cones, barks, twigs). Aerial fuels are those located in the understory and forest canopy and separated from the ground by more than 4 feet (dead branches, draped needles, snags [standing dead trees]). Figure 2. 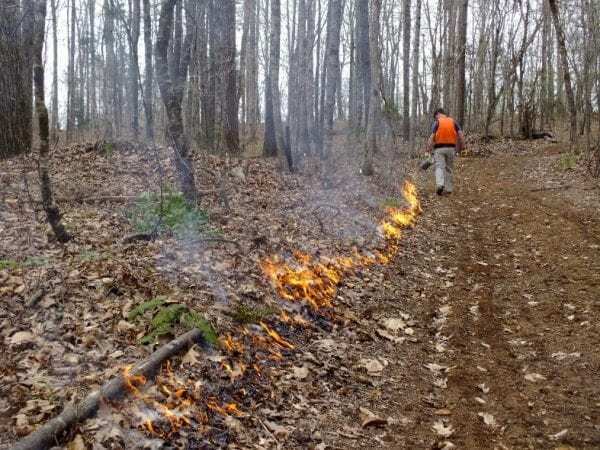 A good fire line is needed to conduct a prescribed fire (right side of photo). The width of the fire line can be as narrow as a plowed line or as wide as several feet. The volume of fuel in the area affects the behavior of the fire and the amount of smoke it produces. Large volumes of fuel pose a significant risk for creating a fire that is difficult to control. More heat and greater fire intensity are produced when there is more fuel to burn. Flammability is affected by oxygen availability among the fuels in the burn area. Compacted fuels have less available oxygen and wind dispersion among the fuel; thus, it takes longer for the fuel to dry out and successfully burn. Fuels loosely arranged ignite faster and burn more intensely. Vines, brush, limbs, and foliage that are growing up trees or are suspended are a part of the fuel arrangement (figures 7a and 7b). These “fuel ladders” are off-the-ground fuels that can carry fire from the forest floor into the canopy. Common fuel shapes include needles, leaves, limbs, logs, palmetto fronds, and peat. The shape of fuel affects the flammability and behavior of fire. Fuels that are flat, such as leaves and needles, have high surface-to volume ratios. They can dry out faster than fuels with low surface-to-volume ratios, such as logs, because they have more surface area for heat to enter. Ignitability is therefore greater in flatter fuels, because less heat is needed to dry out the area. Flatter fuels also burn more rapidly, creating a more intense fire. The size of the fuel affects fuel moisture and the rate at which fuel dries. Smaller fuels ignite more freely than larger fuels. As with the shape of fuel, the time needed to heat fuel is dependent on the surface area in relation to the fuel’s volume. Smaller fuels have a greater surface area-to-volume ratio than larger fuels. As a result, they have a greater probability of ignition. Fuels are broken up into four size categories:1-hour fuels are 0 to . inches in diameter (figure 8a); 10-hour fuels are . to 1 inch (figure 8b); 100-hour fuels are 1 to 3 inches (figure 8c); and 1,000-hour fuels are 3 to 8 inches in diameter (figure 8d). Smaller fuels dry out faster than larger fuels. Grasses, leaves, needles, and small twigs are examples of 1-hourfuels. Larger fuels, such as tree limbs or fallen logs, are classified as 100-hour to 1,000-hour fuels. The amount of moisture in fuel can range from saturated (the maximum water-holding capacity) to being completely dry (often referred to as oven-dry). Depending on the amount of moisture in the fuel, the area could burn completely, partially, or not at all. Each of these circumstances affects fire behavior differently. Air temperature that affects relative humidity and the ability for fuel to dry determines fuel moisture content. The higher the temperature, the faster the fuel dries. However, specific fuel moisture content, regardless of the rate of drying, also depends on the arrangement, shape, size, and shading of the fuel. The moisture content of fine fuel is typically of most importance across the South, as this is the fuel that carries the fire during a prescribed burn. 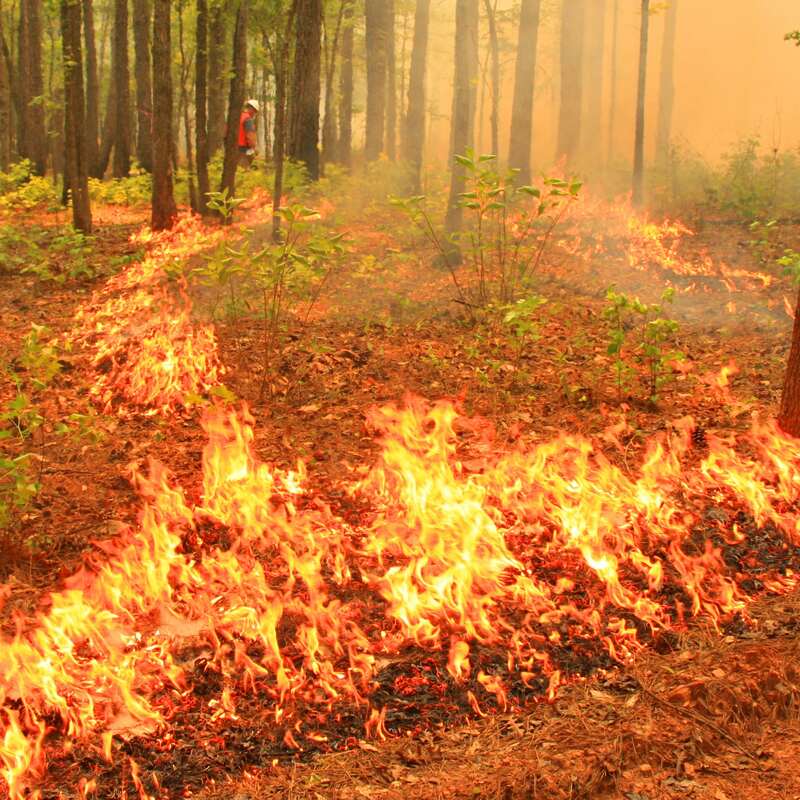 In the South, fine fuel moisture content, ranging from 6 to 10 percent, is effective for a prescribed burn. A fine fuel moisture content of 5 percent or less may become too intense and difficult to control; greater than 10 percent will likely be too moist to carry fire well. A good indication that dead leaves or pine needles will burn is if the leaves crunch into small pieces or the pine needles break when you pick up a handful and twist them. The drier and deeper the fuel load, the more intense the burn will be.